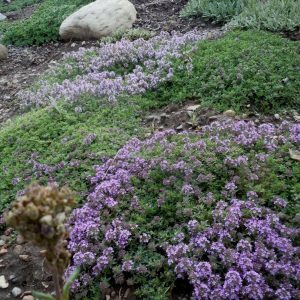 Purple flowers May – August with evergreen foliage on this tiny leaved plant. Good for groundcover or rock garden. Native: Greenland, Norway, Iceland, the Arctic, much of the US incl WI. Thymus from the Greek word for “odor” due to the plant’s fragrance. Ancient Greeks made incense with thyme. This species collected on an exhibition in the Arctic before 1855. 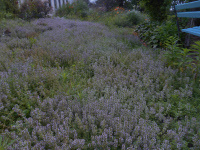 Parkinson describes lemon thyme in 1640 but it may be different than this. Free blooming pixie, palest of pink blossoms from June through October on wiry stems form a 4″ tall mound. Perfect for rock gardens, front of borders or groundcover. Care: sun in well-drained soil. Drought tolerant. Tunica is Latin meaning “tunic” or “coat” referring to overlapping bracts beneath the flower. Near the turn of the century William Robinson described the Tunic flower as having ” elegant little rosy flowers … a neat plant for the rock garden and fringes of borders and thrives like a weed between the stones in a rough stone wall.” “Suggestive of a miniature gypsophila.” H.H. Thomas, 1915. Cultivated in the U.S. since the 1800’s. Swedish botanist Peter Kalm, Swedish botanist , described this in 23 February 1749 entry in Travels in North Americ.a. Important food for Native Americans (Algonquin, Iroquois, Chippewa& Ojubwa). Pilgrims ate the wild berries. American and Canadian sailors on long voyages ate cranberries to prevent scurvy.